Blend up psychedelia, sleazy exploitation, sexual deviance and zombies (of course) and you get something like the upcoming Someone’s Knocking on the Door. Quiet Earth has details, intriguing trailer is embedded after the jump (Quiet Earth). After the jump, the gloriously fucked up and entirely NSFW trailer for Someone’s Knocking at the Door. In non-zombie news, I wrote a review elsewhere of the ridiculous shark vs. octopus movie Mega Shark Versus Giant Octopus, if you like that sort of thing. And don’t forget, two clips after the break! Also, if you’re reading this via RSS, is there any chance I could convince you to either leave me a comment or send me an e-mail and say “hey”? I’m trying to figure out how many of you are out there and I’ve yet to discover a good tool to do so. Thanks! Special thanks to Kotaku for giving me most of my daily zombie news. You get a zombie cookie. To the rest of you, sorry for the lateness of today’s post. My life interfered. 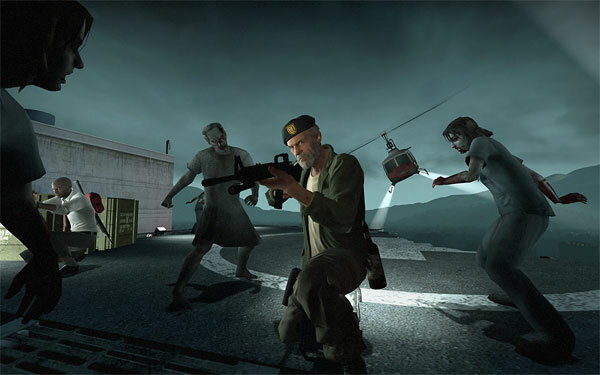 The new Left 4 Dead DLC is available for both PC and Xbox 360. You get the “Dead Air” and “Blood Harvest” campaigns playable in Versus mode, plus the all new Survival mode. And it’s free, which is extra awesome. I lost interest somewhere around the middle of the second Marvel Zombies series, but the tireless folks at Fangoria have kept at it and have a review of Marvel Zombies series four up. When the real zombie apocalypse happens, good tools will be of utmost importance. This modern steel tomahawk looks to be just the thing for zombie killing (hey, it was a slow news day…).